I'm very excited with this update as it was quite a challenge to implement a fishing system like this one. You'll find fishing in almost every MMO out there, but I really wanted something different in terms of mechanics. It could be just me but I don't like the common approuch that is used in most games. You'll see that fishing in most games is very simple as in click on the water and wait for the fish to bait. I wanted to do something a little more exciting and visual appealing. That's why I decided to fill the waters with fish that you can actually see swimming! Seeing the fish swim means you can literally search for the fish you'd like to catch and give it a go. The base mechanics are pretty simple. After you crafted your fishing pole you start searching the waters for fish. Once you spotted the fish you'd like to catch you hold left-mouse button to aim your trow. Releasing left mouse will make your character trow out a fish floater in the water. Now it's time for the waiting game. The fish can spot the floater and swim towards it and may nibble the hook a bit. It can also lose interest and swim along, you could pull back in and trow again if you'd like. Once you got the attention of the fish and the floater goes fully underwater press right-mouse button at the right time to pull in the fish! 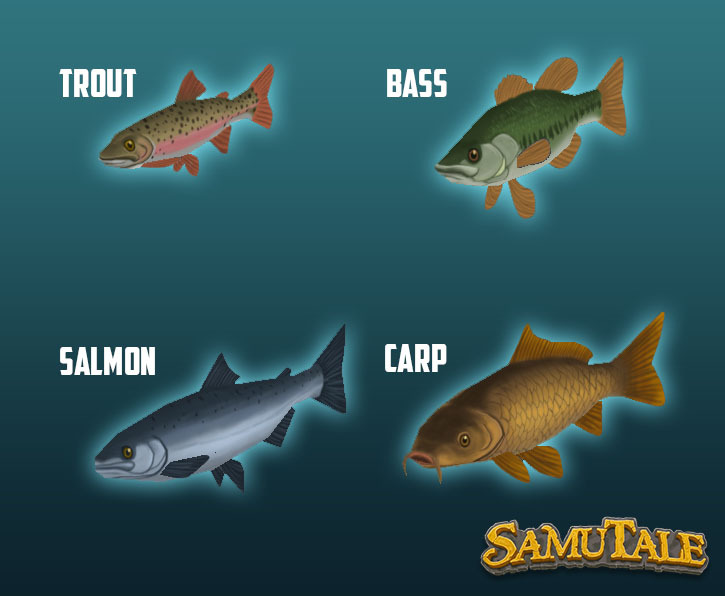 All fishes have different rarity and will (after the map expansion) reside in it's own type of waters. There are some basic cooking recipes added for all the fish, but expect some higher tier (fish containing) recipes in the future. Happy fishing!